The epistle from Acts gives us a curious tale – the girl possessed by demons goes around the city proclaiming constantly that Paul and the others are preaching the path to salvation and are the servants of the Most High God. It is a reminder that while indeed there are evil spirits, even they have to acknowledge Christ and Christianity, and that it is the fullest way of salvation. The history of the Church shows that demonic forces have been unleashed against the Church in the past twenty centuries, from the pagan emperors of Rome to the communists ruling in Asia and Cuba today and the secular forces that are loose in the western world ignoring God and shoving Him and His people out of public life, but the Church continues to endure. The devils may be loose in the world, and they may employ people who have come to hate God and Christianity, but in the end they cannot win. The triumph of Jesus on the Cross and risen from the dead is the victory of the war for souls. Battles are fought for each soul, for a particular area, but Christ has won the war. Finally the epistle gives us another episode from the early Church: the jailer and his entire household are baptized, and a meal is celebrated after the baptism. The whole household: everybody, of all ages and all social status, and the meal is obviously the Eucharist being celebrated by Paul. It serves as a reminder of the ancient order of the three sacraments of Initiation being available to infants as we have been doing – baptism, Chrismation/ confirmation, and holy communion. This series is still the norm in the Roman Church, even though it has been disrupted in the last 100 years by St Pius X separating Confirmation and Communion, and though infant Communion disappeared in the Roman Church after the Protestant reformation: when someone converts to the Roman Catholic Church at Easter, they are to receive all three sacraments together. And many dioceses of the Roman rite are restoring the unity of Confirmation and Holy Communion for young children in light of this ancient usage. This is the last Paschal Sunday of 2018: the Easter season ends with sunset on Wednesday – this week we will celebrate Ascension Thursday, a holy day of obligation. In the Roman rite archdiocese of Santa Fe the feast is moved to Sunday, so if you can’t come here and go to a Roman Catholic church for Mass it won’t be the feast day readings. In the American Roman Catholic Church only the dioceses in the states of Connecticut, Massachusetts, Nebraska, New Jersey, New York, and Pennsylvania still keep Ascension Thursday. All Eastern Catholic Churches around the world keep the feast on Thursday. Why does that matter? Easter is kept for forty days, then we have nine days from the ascension of Our Lord back into heaven until the Holy Spirit is sent down to us on Pentecost. The forty days obviously matter in Scripture: forty is used as a time of preparation and purification: the flood lasted 40 days; there are 40 years of Israel wandering in the desert until the new generation of Israelites is ready to enter the promised land; Jonah fasted for forty days before preaching in Nineveh; Jesus fasted for forty days before beginning His public ministry. The last Sunday of the forty days is a particular feast of a stupendous miracle but also a conflict. For the 3rd Sunday water is used again , this time to wash the eyes of the man born blind, as a sign of our baptism. All of the preaching in the forty days was directed toward the new converts to strengthen them in their faith, and to the existing Christians to remind them of why they had been baptized. But the conflict reminded the new converts that their choice means they have to stand up against temptation to yield to the past, or to forces around them that don’t want Christ’s Church and the true faith to lead them forward in life. The miracle is that of a man born blind is cured; other cures had been of people who probably had cataracts or glaucoma, but here it is someone blind all along. The conflict of Jews expelling believers in Jesus as the messiah and Son of God didn’t happen in Jesus’ lifetime – John has taken what the members of his church experienced and put it into Jesus’ time so that they can see that really we always have to make a clear choice regarding faith in Christ. The man sets out, with the clay on his eyes, walking through the city to Siloam, whose name means One who is sent. Jesus sends him off testifying simply by his odd appearance, soon to testify with his own words, and when the blind man washes off the clay he can see. Rather than accept the obvious proof of Jesus’ power, the Pharisees reject the miracle and reject the man. But when he hears Jesus’ voice, then the man worships Him. The man rejected as steeped in sin since birth, the man who the leadership could not tolerate seeing, hears and sees the truth in the person of Christ. It is a tremendous moment in the gospel, since very few people ever worshipped Jesus during His lifetime on earth. God the Father made all things through Christ our Lord Who calls us all to serve Him and to love Him; the Holy Spirit lives in each of us; we are all made in the image and likeness of God. We are here in this church to worship God and to receive the Holy Body and Life-giving Blood of Christ. We exist to worship God. Without priesthood there is no Eucharist, and in the Eastern Churches that also means no baptism, no confirmation, no weddings. We have been asked to submit names of people we think God may be calling to the priesthood, or the diaconate, or consecrated life. God speaks to the human heart – sometimes we may be afraid to hear Him, or think we are unworthy to serve Him. But He calls us, and He has set up His Church on earth so that priesthood is necessary, diaconate is very important, and consecrated life brings joy to Him. I am going to observe 37 years of ordained ministry on May 10th. It hasn’t gone the way I expected, not at all. I had no knowledge about Arizona or New Mexico when I was ordained in New Jersey, except for the story of the statue of Our Lady, La Conquistadora, in Santa Fe. I always have had physical challenges since I was a baby, but I never thought I’d need a wheelchair and be limited in getting around or working or writing. Bishop Dudick who ordained me intended to send me to Rome for study, but instead I ended up in Phoenix because I needed a dry climate. I came here after 3 years in Phoenix, not knowing a soul except Agnes Adamsko, whose daughters still attend here and whose grandson-in-law is a deacon in Phoenix. I’ve made a lot of mistakes, committed lots of sins, but have somehow managed to stay in the priesthood all this time. There are things I wish I had done, and things I wish had never done. But the wonder of God’s loving mercy is that He continues to abide with us, that He continues to invite us closer. We are not trapped in one stage of life – to live a sacramental life with regular reception of the Mysteries of the Holy Eucharist and Confession is to live a life fortified by God. I cannot do a lot of what I enjoyed doing – I never imagined when running down the steps of a subway station to catch a train that I’d be in this chair. At the same time, I never imagined that the fellow I corresponded with in the eparchy of Mukachevo would end up following me as pastor of this parish. The Christian life is filled with surprises. Priesthood is loaded with surprises, one of the greatest being the realization that when we step aside and let God’s grace work through us, marvelous things can happen: people are born again into the Trinity, sins are forgiven, couples are married, the sick find healing and strength, bread and wine become the living Body and Blood of Jesus Christ. Stepping aside and letting God work through us is a good model for anyone to live by. Standing in God’s way only causes problems. Continue to pray for vocations: our parish has produced four priests, two Sisters, and one monk so far, even though our population has never gone over 150 souls. Continue to pray for those who are ordained to priesthood and diaconate or have taken religious vows. Continue to love God and to love His Church – Vatican II clearly taught in Dignitatis Humanae: this one true religion continues to exist in the Catholic and Apostolic Church, to which the Lord Jesus entrusted the task of spreading it among all people … all persons are required to seek the truth, and when they come to know it, to embrace it and hold fast to it, paragraph 15. We are blessed to have seen many people convert to the faith in this parish because of this parish, we are blessed to have seen Catholics return to faith in this parish, and we are blessed to see Christian family life flourishing in our parish, both in extended families and as a parish family. 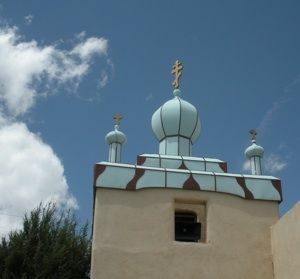 Let us ask God in this liturgy and in our own private prayers that this parish be a spiritual powerhouse of vocations to ordained, consecrated, married, and single life, of people committed to not only this parish but to this Catholic and Apostolic religion which our parish seeks to proclaim to all New Mexico in our unique way as Byzantine Catholics. May the Most Holy Trinity strengthen us, may Our Lady of Perpetual Help, to whom I’ve been devoted since I was a little boy, watch over us, may we listen to the voices of our guardian angels in making right choices, and may we be strengthened by the prayers of our saints and martyrs, to stand firm in this faith handed down to us from Christ by the apostles and their successors. Like the man born blind, may we hear God’s voice, and fall down and worship Him. Christ is among us. Okay, I’m a day late (and a dollar short…) Happy Anniversary Father Chris! As usual, a very good sermon. Now I have another document (Dignitatis Humanae) to read! I think you know (but doesn’t hurt to remind you) of the great impact you had down here via the BC mission in the diaspora of Las Cruces — the seed you planted (I hope in rich soil) has and is bearing much fruit. I think of this germination often, especially when I start the weekly BC catechism with my grandkids and they seem to always want to start with the singing of the Hymn of the Incarnation or O heavenly King! I thank you and pray for you often!